One of the best kept secrets in St Pete! – This restaurant has a beautiful outdoor oasis and a relaxing ambiance. 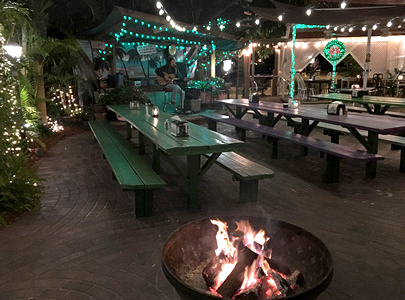 Local music talent is featured several nights a week on a quaint little stage with an Old Florida tropical atmosphere! Firepits are lit on cooler nights adding to the beauty of this already unique setting. Award winning burgers are the all-time favorite with the locals here! One of the biggest surprises of all is a trip indoors to feel like you’re stepping off the boat into a genuine English Tea Room. This place is one you won’t soon forget! It’s been a part of the community in one form or another for over 90 years! And so the tradition continues…albeit with a bit of a British flair! 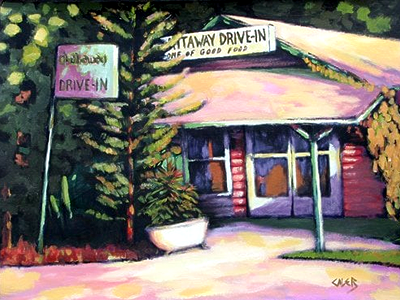 The Chattaway is part of your community — a local institution in Old Town St. Petersburg. Stop by and see us if you’ve never been here before! We promise it will be an experience you’ll never forget! British Afternoon Tea served by Lady Chattaway, $35.00 per person. This includes assorted sandwiches, scones with Devonshire Cream, Crumpets with Irish Butter, Petit Fours, Raspberries and Cream and all the English tea you can drink. You must call ahead @ 727-823-1594 for Afternoon Tea so that your choice of items suit your liking and that of your guests. We are certain that you will enjoy your experience. A truly unique oasis in the middle of Old Town St. Petersburg — stop by and try us — you won’t be disappointed! We’re the “Home of Good Food” — down-home cooking that reminds you of the old days! We’ve got something for everyone! Looking for a place to eat with that Old Florida feel? Or a place to experience a British Afternoon tea? Stop by & meet our family!